Jimmy Carter, the 39th president of the United States from 1977 to 1981, joined Emory's faculty in 1982. He serves as University Distinguished Professor at Emory. 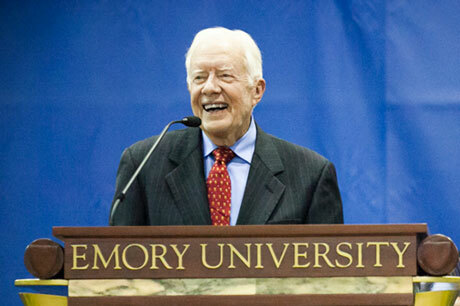 Former U.S. President Jimmy Carter, University Distinguished Professor at Emory, answers questions posed by first-year students at his 33rd annual Carter Town Hall in 2014. President Jimmy Carter addressed students studying China in political science, history and Chinese language classes in 2010.